Alice Queen Limited ("Alice Queen") is an Australian listed public company (ASX:AQX), that is developing a number of Gold and Copper exploration and mining opportunities. Alice Queen has assembled an experienced team of mining executives with the requisite corporate and technical skills, along with a broad base of investors. 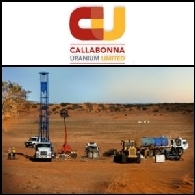 2010年10月25日澳洲股市报告包括：Callabonna Uranium (ASX:CUU)将开始一项土壤勘查，以圈定北领地Denison稀土/铀矿项目的钻探靶区；Navigator Resources Limited (ASX:NAV)已筹资1100万澳元用于勘探;Centaurus Metals Limited (ASX:CTM)已开始新的JORC资源估算和选矿测试工作;Shaw River Resources (ASX:SRR)在西澳的Baramine项目已钻遇品位更高的矿体.